It’s no secret that we love anything and everything Google. Google is one of the top names on the web these days and every product they release is innovative and very well thought out. Google Analytics is no different. 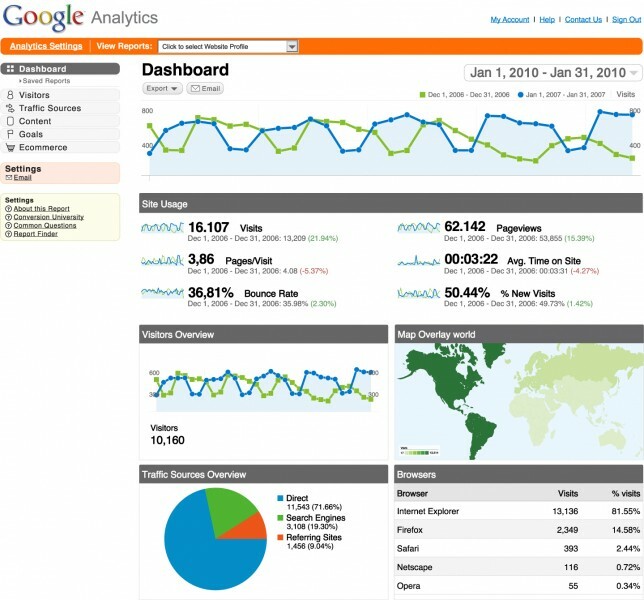 Google Analytics is a tool which allows you to see where and how traffic comes to your website. You can view reports and learn a tremendous amount of information about your website and how it interacts with other sites and tools on the web. This incredible application shows insightful information which helps us make the best possible decisions about the steps to take when enhancing your site. Now, with the ability to study web trends, we can see what’s working and what’s not when it comes to your online Marketing needs. We use Google Analytics on every single one of our sites. Don’t get stuck using the visit counter of the 90s which shows everyone who visits your site how many hits you’ve received. Not only are these counters not reliable, they usually have only one function…counting. Prepare yourself to be blown away with the most advanced reporting tool on the web today and let us show you how easy it is to get Google Analytics up and running quickly and painlessly.